My paintings are not assertions of a kind of "knowing"; they exhibit no conclusions. I discover myself being here within a process. My works are human marks to celebrate my growing and living within this process. We are making (around ourselves by human gesture, marks, building) extensions of our living and being here. These celebrate the hope of our living and growing: the neon flickers; the bill-board leaps in landscape; telephone-booth markings reveal us. Our part in making this complex, giant, ever emerging, and changing landscape is where we "see" a true sign of our hope. Sometimes it is painful to see the poverty of our hope written in this landscape. Through painting I project color and add a human mark to this environment-landscape. We think things out and our logic fails us; we have marvelous feelings and emotional leaps; we follow them and they too leave us incomplete. My paintings are spontaneous emotion; they are also calculated precision; they search to resolve oppositions in a visual dialogue; they are born from the belief that we are growing to a great love that will resolve the ambiguous and deliver us to Peace. 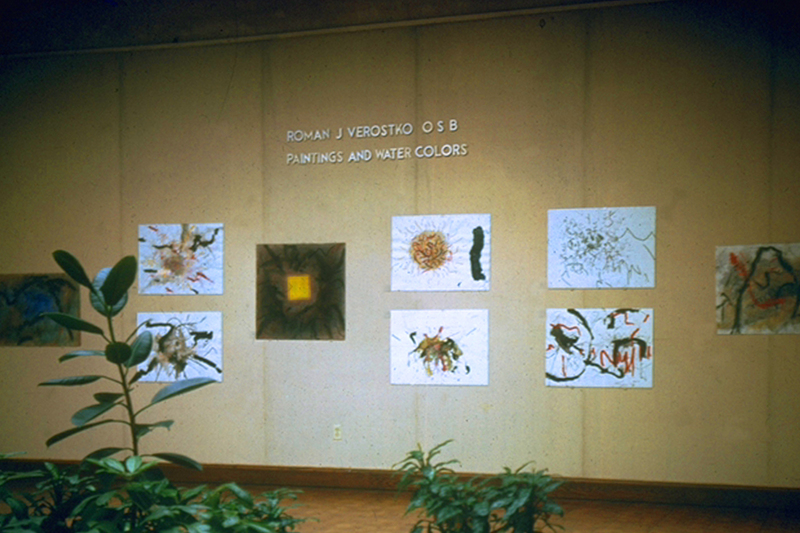 (Quoted from the Catalogue of Roman Verostko's 1995 exhibition at the Westmoreland County Museum of Art, Greensburg, Pennsylvania .